HomeBrowse LibraryCustomer Payment Trends are Changing. Are You? Customer Payment Trends are Changing. Are You? Human beings have utilized everything from food and crafts to checks and mobile pay to purchase goods and services. The ability of businesses to analyze and adapt to ever-changing consumer behavior and preferences is crucial to their financial success. As technology has improved and integrated itself into our economy, consumers are already changing their preferences along with it. In this month’s infographic, “How Customers Want to Pay: Is Your Small Business Keeping Up,” we delve into the customer payment trends now facing small businesses. In the same way payments of the past have come and gone, cash is becoming a less desirable payment option for consumers. A whopping 46% of people surveyed say they rarely or never use cash, and 20% said they don’t even carry it with them. Since the use of cash is dwindling, people have turned to other methods of payment. How do people want to spend? Instead of cash, customers want options when it comes to how they pay. A study conducted by the Federal Reserve shows that B2C customers spent $105.3 billion on noncash payments while B2B customers spent $24.6 billion. Among the B2C customers, the majority preferred debit cards, to the tune of $57.4 billion. Meanwhile, in the B2B sector, ACH electronic bank transfers at $9.6 billion were the most common form of cashless payment followed closely by checks at $8.7 billion. Credit cards were used modestly by both sectors, with $26.9 billion being spent by B2C customers and $4.1 billion being spent in the B2B arena. Aside from the more traditional payment options, mobile pay is quickly catching up. From 2015 to 2017, the total number of Apple Pay users increased from 15 million to 86 million people, and Android Pay users increased from 2 million to 24 million. That’s an increase of 71 million users for Apple Pay and 22 million users for Android Pay. With an uptick like that, it’s a safe bet that mobile pay will continue to trend upward. Although mobile pay is on the rise, people are still worried about online security. The concern over fraud has caused 37% of those surveyed to stop purchasing anything over the web. Out of those who still make online purchases, 42% use credit cards, 26% use PayPal, 12% use a debit card, 10% use prepaid cards or gift cards, and the final 10% have no preference for how they purchase goods online. Surprisingly, 38% of small businesses haven’t updated their payment methods in the last five years. Simply put, businesses that haven’t adapted these new payment trends are missing out on easy ways to improve their cash flow, keep customers happy and increase sales. Upgrading the way your small business accepts payments doesn’t have to be a hassle. Talk to a SCORE mentor today about ways you can make the transition into new methods of payment. 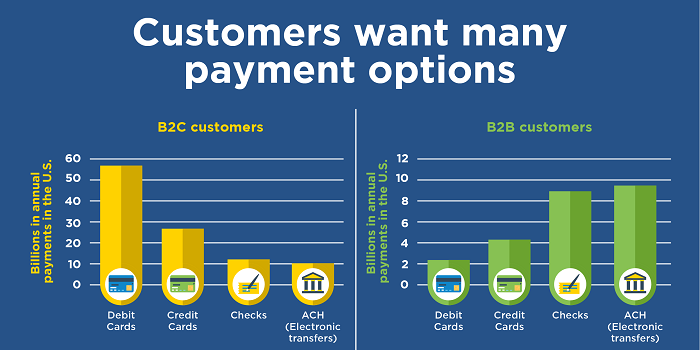 Infographic: How Customers Want to Pay - Is Your Small Business Keeping Up?